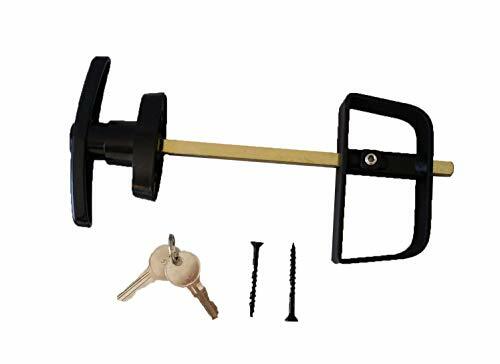 Shed T-handle Lock Set Black 6 1/2"
This is a complete locking shed door handle kit, suitable for any kind of outdoor building, including storage sheds, playhouses, chicken coops, chicken tractors, barns, and more. 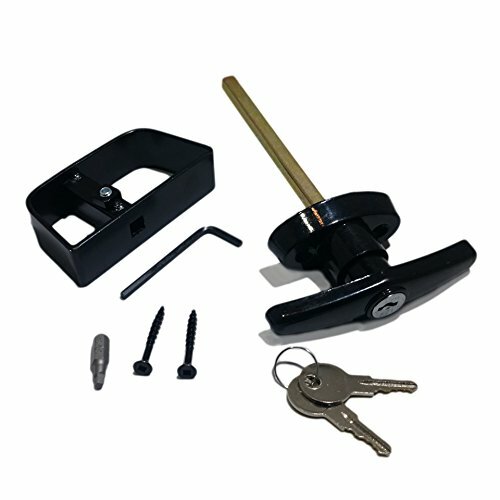 This kit includes both the outside locking T-Handle, and the inside D-Handle, two keys, and two self-drilling screws. 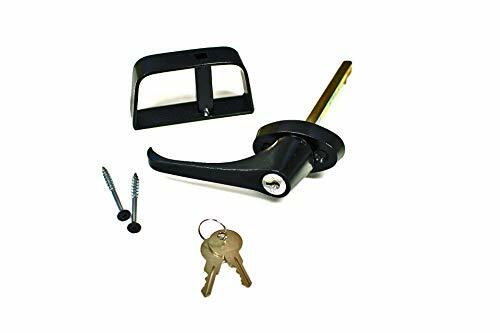 It also includes two tools that you will need for installing this shed door handle: a #2 Square Bit for driving the wood screws, and a " RDX Short Arm Hex Key / Allen Wrench for tightening the set screw on the interior shed door handle. 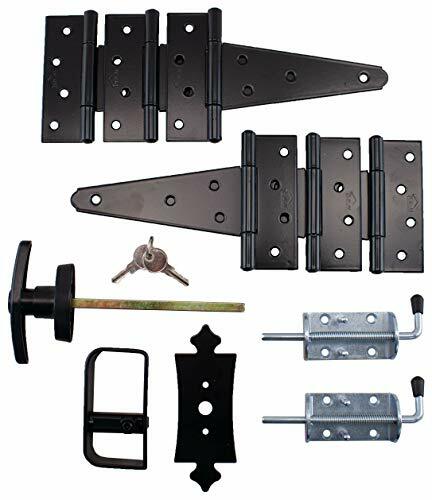 This kit includes everything you need to install your new shed door lock. The two screws included in this kit are self-drilling, which eliminates the need for pre-drilling. 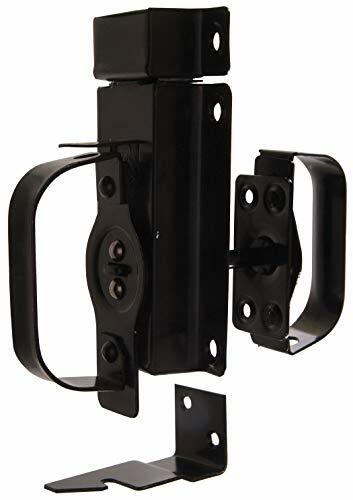 The screws, the front T-Handle, and the interior D-Handle, are all black powder-coated, for superior durability and resistance to the elements. Includes a #2 Square Bit for the wood screws, and a Hex Key for tightening the set screw on the interior handle. These handles are used for storage sheds, playhouses, and any small buildings. Includes: Front T-Handle, 2 screws and two keys. Includes four self-drilling wood screws (no pre-drilling required!) Includes a #2 Square Bit for the wood screws, and a Hex Key for tightening the set screw on the interior handle. The Shed T-Handle Lock Sets Are Perfect For any Outdoor Building That Needs To be Locked. Shed Windows and More, Inc. , carries the largest selection of shed windows, shed hardware, shutters, skylights, vents, flower boxes, etc for all kinds of outdoor buildings, such as, sheds, playhouses, animal shelters and more. We also have a line of PVC double pane windows for tiny houses, bathrooms or any building were a small insulated window is needed. If you , do not see the item you need, please ask! Shed Windows and More might have it in stock, or have the ability to order it for you. Shed Windows and More your number 1 place for shed supplies and small windows. The Shed T-Handle Locks are Perfect for Locking Up Any Small Outdoor Building. Shed Windows and More, Inc. , carries the largest selection of shed windows, shed hardware, shutters, skylights, vents, flower boxes, etc for all kinds of outdoor buildings, such as, sheds, playhouses, animal shelters and more. We also have a line of PVC double pane windows for tiny houses, bathrooms or any building were a small insulated window is needed. If you , do not see the item you need, please ask! Shed Windows and More might have it in stock, or have the ability to order it for you. Shed Windows and More your number 1 place for shed supplies and small windows. 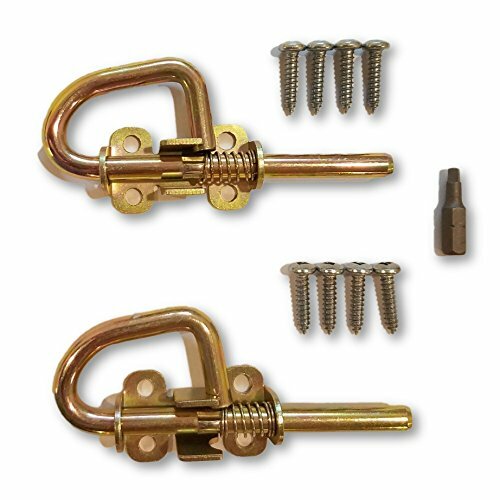 One Pair of Loop-Style Spring Barrel Bolts With Screws and Square Bit. Loop Style Barrel Bolts are used to Secure the Stationary Door of Your Double Door Shed. Typically, one pair is used per door, with one barrel bolt at the top, and another at the bottom. 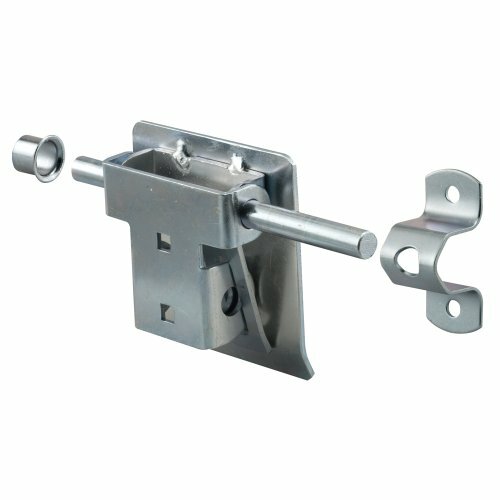 These feature a built in spring to keep the bolt from siding down when you are opening or closing your shed doors. Great for Shed Doors, Gates, Chicken Coops, Barn Doors, Playhouse Doors, or any other building project. Includes a #2 Square Bit that fits the included wood screws. Works with any screwdriver or drill with interchangeable bits. When used for a shed, these barrel bolts are used to secure the stationary door of your shed. Typically installed with one barrel bolt at the top of the door, and another at the bottom. 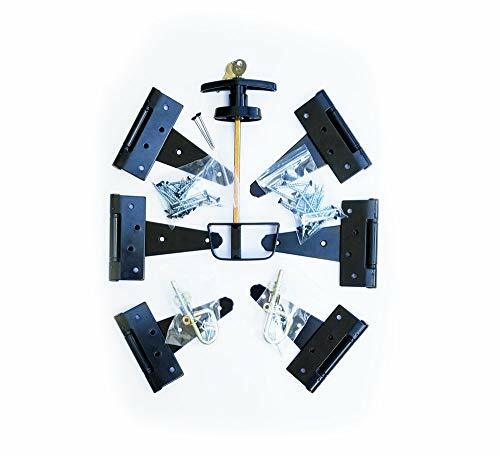 Shed T-Handle Locks Sets Can Be Used In Any Outdoor Building That Needs To Be Locked. Shed Windows and More, Inc. , carries the largest selection of shed windows, shed hardware, shutters, skylights, vents, flower boxes, etc for all kinds of outdoor buildings, such as, sheds, playhouses, animal shelters and more. We also have a line of PVC double pane windows for tiny houses, bathrooms or any building were a small insulated window is needed. If you , do not see the item you need, please ask! Shed Windows and More might have it in stock, or have the ability to order it for you. Shed Windows and More your number 1 place for shed supplies and small windows. Everything you need in one kit for a shed double door. Shed Windows and More, Inc. , carries the largest selection of shed windows, shed hardware, shutters, skylights, vents, flower boxes, etc for all kinds of outdoor buildings, such as, sheds, playhouses, animal shelters and more. We also have a line of PVC double pane windows for tiny houses, bathrooms or any building were a small insulated window is needed. If you , do not see the item you need, please ask! Shed Windows and More might have it in stock, or have the ability to order it for you. Shed Windows and More your number 1 place for shed supplies and small windows. 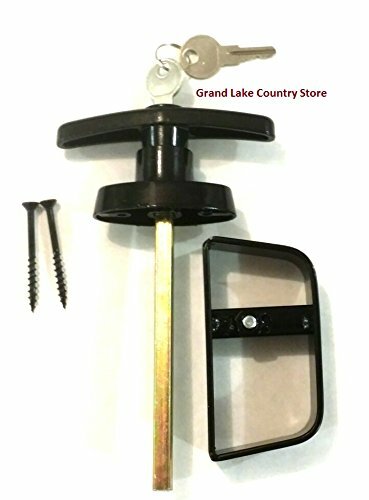 The Hardware Essentials Swinging Door Latch is a heavy duty latch designed for in and out swinging doors 3/4" to 2-1/4" thick. Ideal for use on sheds, barns, storage bins and other residential and agricultural applications. Automatically latches when door is closed. Includes a separate bracket that is used to hold open doors. Can be used for right or left hand applications and in or out-swinging doors. Can be pad locked for additional security. The Shed T-Handle Lock Sets Are Perfect For Locking Any Small Outdoor Building. Shed Windows and More, Inc. , carries the largest selection of shed windows, shed hardware, shutters, skylights, vents, flower boxes, etc for all kinds of outdoor buildings, such as, sheds, playhouses, animal shelters and more. We also have a line of PVC double pane windows for tiny houses, bathrooms or any building were a small insulated window is needed. If you , do not see the item you need, please ask! Shed Windows and More might have it in stock, or have the ability to order it for you. Shed Windows and More your number 1 place for shed supplies and small windows. Made of stainless steel material, this security barrel bolt can be used for a long time.Ideal for locking door, window, drawer or cupboard. 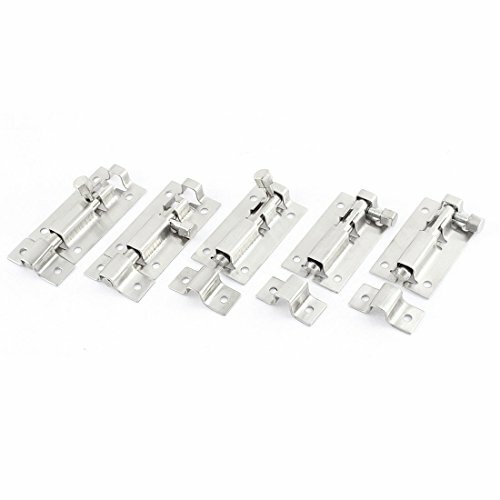 This garage door lock is constructed from heavy gauge steel and comes plated in zinc. It features a tamperproof cover plate and 2 keepers for either mortise or surface mount applications. This lock requires the use of a padlock. and the inside D-Handle, two keys and two self-drilling screws. 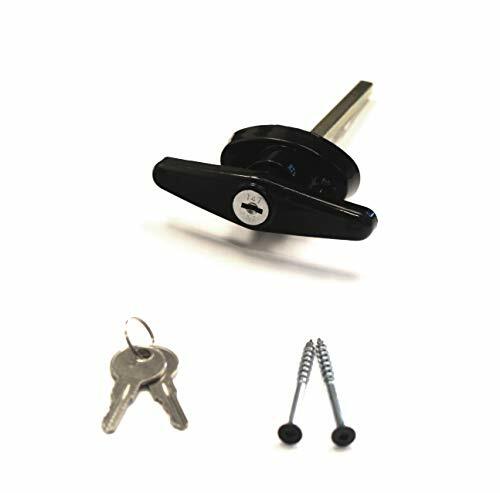 This Shed lock kit includes everything you need to install your new shed door lock. and the interior D-Handle, are all black powder-coated, for superior durability and resistance to the elements. 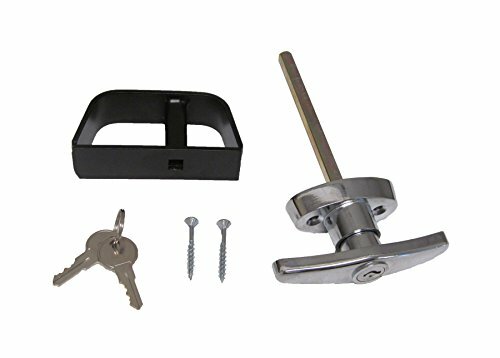 Shed Door Lock Kit includes outside locking T-Handle, inside D-Handle and 2 Keys, 2 Screws and 1 Hex Key. Black Powder Coated Finish - Also Comes in Chrome. 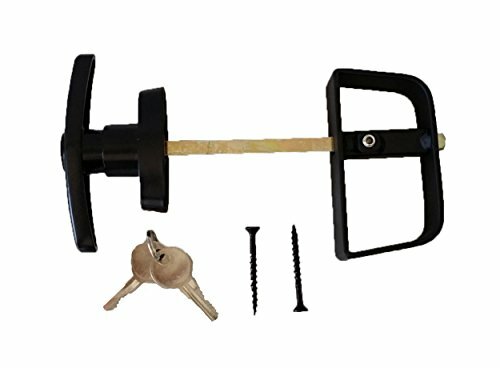 The Shed T-Handle Lock kit is Excellent for Sheds, Barns,Backyard Playhouses & Chicken Coops Doors. 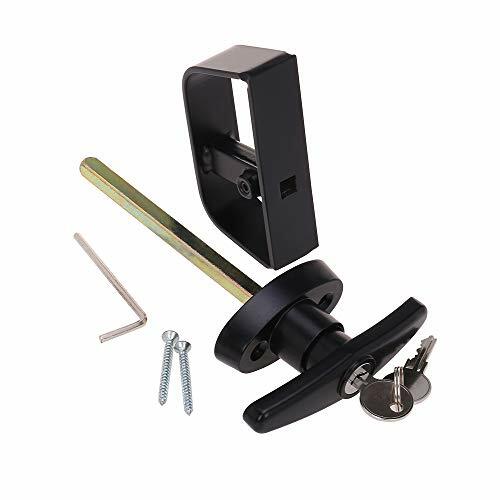 The Shed Door Hardware includes everything you need to install your shed door lock. Shed T-Handle Lock Sets are Perfect for Any Outdoor Building That needs to be Locked. Shed Windows and More, Inc. , carries the largest selection of shed windows, shed hardware, shutters, skylights, vents, flower boxes, etc for all kinds of outdoor buildings, such as, sheds, playhouses, animal shelters and more. We also have a line of PVC double pane windows for tiny houses, bathrooms or any building were a small insulated window is needed. If you , do not see the item you need, please ask! Shed Windows and More might have it in stock, or have the ability to order it for you. Shed Windows and More your number 1 place for shed supplies and small windows. 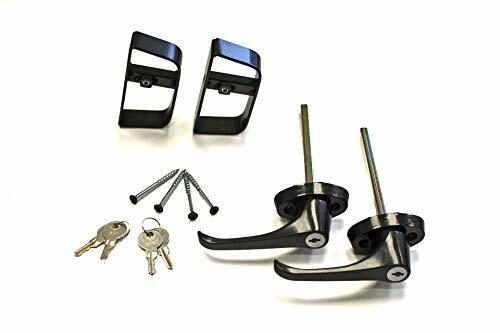 1 pair of 5-1/2" L Handle Lock Sets (Black) keyed alike Includes L Handles, Adjustable D handles, 4 keys, and Screws These are great for sheds, gate doors, playhouse doors, or any other building project. 5-1/2" stem will fit doors up to 4-3/4" thick. Back D Handle is adjustable. Handles move 1 direction.